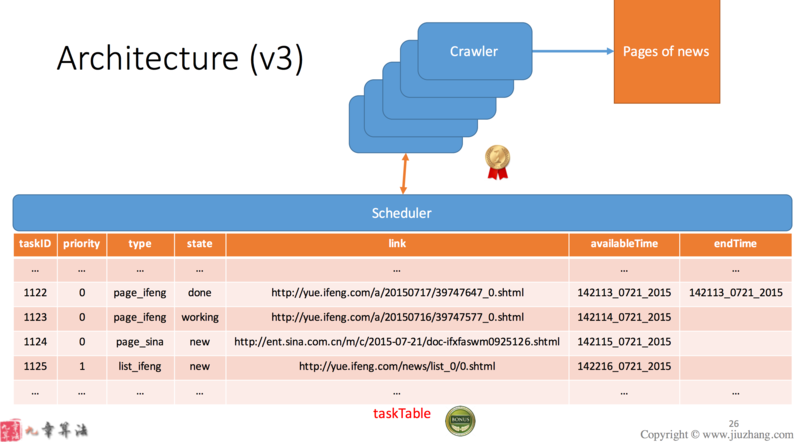 Here we have multiple crawlers which infinitely checking if the task table has any task with status=new, if so we take one task then crawl the page. If the page is a list of the links to other page, we create a task for each link and save to task table. If the page is a real news page, we save it to page table. Eventually we read all the real pages from the page table. What we can do is if while check if there is any new task in the table, if not, we make the thread sleep for a certain time. //we still need to update the task by setting the status to be "done"
In this case, we put all the waiting crawler thread into cond.waitList if there is any. synchronized keyword is used for exclusive accessing. 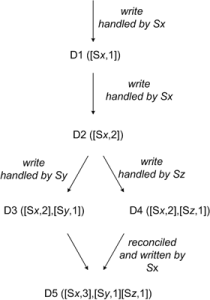 To make a method synchronized, simply add the synchronized keyword to its declaration. Then no two invocations of synchronized methods on the same object can interleave with each other. Tells the calling thread to give up the monitor and go to sleep until some other thread enters the same monitor and calls notify(). Wakes up the first thread that called wait() on the same object. It should be noted that calling notify() does not actually give up a lock on a resource. It tells a waiting thread that that thread can wake up. However, the lock is not actually given up until the notifier’s synchronized block has completed. So, if a notifier calls notify() on a resource but the notifier still needs to perform 10 seconds of actions on the resource within its synchronized block, the thread that had been waiting will need to wait at least another additional 10 seconds for the notifier to release the lock on the object, even though notify() had been called. Wakes up all threads that are waiting on this object’s monitor. The highest priority thread will run first in most of the situation, though not guaranteed. Other things are same as notify() method above. 1) Producer thread produce a new resource in every 1 second and put it in ‘taskQueue’. 2) Consumer thread takes 1 seconds to process consumed resource from ‘taskQueue’. 3) Max capacity of taskQueue is 5 i.e. maximum 5 resources can exist inside ‘taskQueue’ at any given time. 4) Both threads run infinitely. //infinite loop so that producer keeps producing elements at regular interval. //simulating time delays in consuming elements. //(that’s why producer is out of waiting state), consumer gets the notification. 1) Here “produce(counter++)” code has been written inside infinite loop so that producer keeps producing elements at regular interval. 2) We have written the produce() method code following the general guideline to write wait() method as mentioned in first section. 3) Once the wait() is over, producer add an element in taskQueue and called notifyAll() method. Because the last-time wait() method was called by consumer thread (that’s why producer is out of waiting state), consumer gets the notification. 4) Consumer thread after getting notification, if ready to consume the element as per written logic. 5) Note that both threads use sleep() methods as well for simulating time delays in creating and consuming elements. //infinite loop so that consumer keeps consuming elements whenever it finds something in taskQueue..
//Once the wait() is over, consumer removes an element in taskQueue and called notifyAll() method. //(that’s why producer is in waiting state), producer gets the notification. 1) Here “consume()” code has been written inside infinite loop so that consumer keeps consuming elements whenever it finds something in taskQueue..
2) Once the wait() is over, consumer removes an element in taskQueue and called notifyAll() method. Because the last-time wait() method was called by producer thread (that’s why producer is in waiting state), producer gets the notification. 3) Producer thread after getting notification, if ready to produce the element as per written logic. Noted that we need a counter as an id for each task. Since we might need more than one producer, instead of passing int or Integer(both of them are immutable), we need to have a wrapper object so that we can pass by reference to be shared between multiple producers. Once Alice clicks the search box, it sends off a request(basically calling first-degree.php in this case) to retrieve all of the user’s direct friends, pages, groups, applications, and upcoming events. Then save it in the browser cache. So that it can immediately show the results without sending another request. 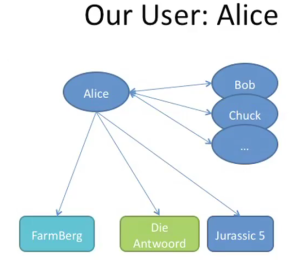 Now Alice types ‘B’, it should first show Bob since it is in the browser cache. 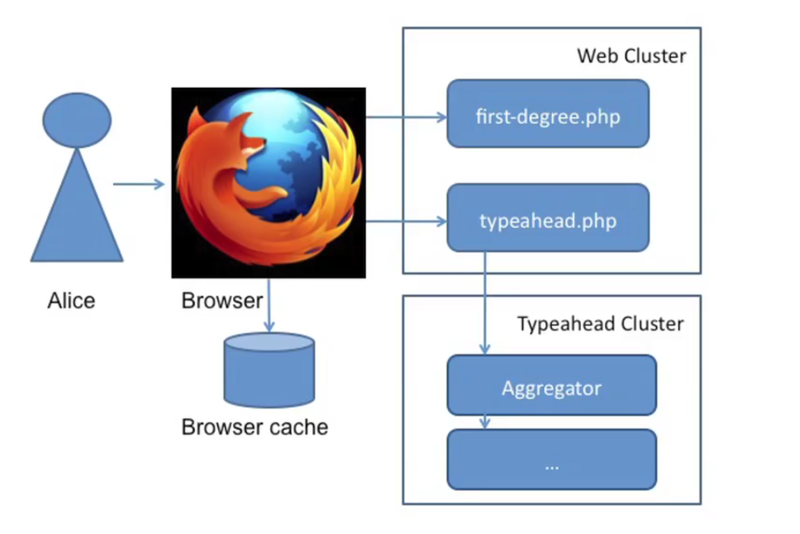 Then it fires an ajax request (typeahead.php in this case), the load balancer is responsible for routing the request to different servers. Typically each server only handles one specific category of results(friend-of-friend, object-of-friend, events, etc). Those blue rectangles are services which could be applied on multiple machines. The global service is for something which are independent to querying user. Like the most popular game or event, since ther we can save latency by storing recent results in a memcached-based query cache. Aggregator delegates queries to multiple lower-level services in parallel and integrating their results. The results returned by the aggregator are simply a list of ids. 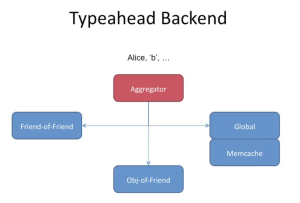 The web tier needs to fetch all the data from memcache/MySQL to render the results and display information like the name, profile picture, link, shared networks, mutual friends, etc. The web tier also needs to do privacy checking here to make sure that the searcher is allowed to see each result. 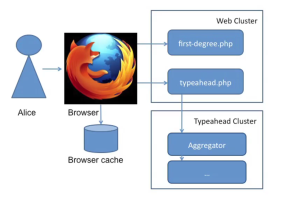 The results with all the relevant data are sent back to the browser to be displayed in the typeahead. These results are also added to the browser cache along with the bootstrapped connections so that similar subsequent queries don’t need to hit the backend again. building that had an average of 100 people per floor to most efficiently fill and empty the building given a standard 9-5 workday and traffic conditions in my city? The answer needed to be completely detailed, including expected passengers per car, time per stop, average floors stops per trip at various hours, etc. What is the capacity of each elevator? Is the efficiency goal focused only at the start & end of day & not in between (i.e. lunch time, breaks)? The first advice that I’ve read is to ask some questions before you start answering. It will show that you are strategic & don’t jump to random assumptions. So I will probably ask questions like: Is the efficiency goal focused only at the start & end of day & not in between (i.e. lunch time, breaks)? How many elevators are there? What is the capacity of each elevator? 2) Assuming that everything is average, i.e. 6 elevators, 15 people per elevator, and focus only on start and end date, then the sample data should follow a normal distribution. 3) I will break this down & solve the worst case scenario first. This means, 34 people x 40 floors = 1360 people to be transported by 6 elevator x 15 = total 90 capacity during 830-9 or 9-930 am. 4) Focusing on this more manageable problem, 1360 / 90 means each elevator will make 15 full cycles (lobby to highest floor and back) 5) Since we want to minimize the cycle time for each elevator, we assign one elevator per subset of 40/6 consecutive floors. This should address the issue on minimizing time per stop. 6) That means, the final design should be a load balancing of the elevators by minimizing the travel time — Elevator A – 1st to 7th floor, B – 8th to 14th floor, and so forth. Do you guys see anything wrong with this line of thinking? 2 Door, properties: State, method: open, close， getState. Each button press results in an elevator request which has to be served. Each of these requests is tracked at a global place. ElevatorRequests, the class which stores elevator requests can use different strategies to schedule the elevator requests. The elevator is controlled by a controller class which we call ElevatorController. The elevator controller instructs the elevator what to do and also can shutdown/start up the elevator of the building. The elevator controller reads the next elevator request to be processed and serves it. Button is abstract class defining common behavior like illuminate, doNotIlluminate. FloorButton, ElevatorButton extend Button type and define placeRequest() which is invoked when the button is pressed. In conclusion, ElevatorController runs the show by reading the ElevatorRequests to process and instructing the Elevator what to do. User send request by pressing Buttons. Each elevator have 1 controller. Floor based requests can be served by any elevator, thus these requests are added to a common area accessible by all controllers. Each elevator controller runs as a separate thread and checks if it can process a floor request. Mind synchronization issues. High write availability (this is based on their use cases like shopping carts, user should be able to update the shopping carts anytime). So the design is also writable and resolve conflicts when read. ACID(Atomicity, Consistency, Isolation, Durability) are not strictly followed since it targets applications that tolerant weaker consistency, which is called eventually consistency. When to resolve update conflicts? Read or Write? Who to resolve the conflicts? The data store or application? The application is responsible to resolve conflict updates. Since data store only has simple police like “last write wins” to resolve conflicts while application has more knowledge of each different situations and could have different strategy to resolve conflicts. Add/Delete one node at a time without having a huge impact on both read/writes of the system. No outstanding nodes. Each node should have the same responsibilities as its peers. Version size is decoupled from update rates. Provides high availability and durability guarantee when some of the replicas are not available. Synchronizes divergent replicas in the background. Gossip-based membership protocol and failure detection. Preserves symmetry and avoids having a centralized registry for storing membership and node liveness information. Dynamo is setup, N is assigned as a parameter indicating each data item is replicated on N nodes. 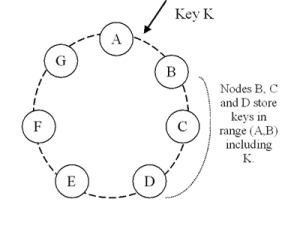 Each key contains a list of nodes which is responsible for its read/write operation. Which is called Preference List. Length of the preference list should be larger than N just in case nodes failures. Using the consistent hashing, each node finds its coordinator, who is responsible to replicate the data to N-1 clockwise successor nodes. Vector Clock is used to show if there are update conflicts. Mainly used in key-value storage which doesn’t have locks for writes to pursue better performance. D5([Sx, 3],[Sy, 1],[Sz,1]) means data item 5 which was updated by Sx 3 times, Sy 1 time, Sz 1time. Using the vector, it is easily to find out if two different version are parallel. When reads the data, the vector clock is also included in the data item. Cons: Vector Clock some times could be too long if there are many different servers involved in writes. But in real cases it should not happen since writes are generally handled by top N nodes in the preference list of that key. Even if it happens, we can have a upper bound size of the vector clock and get rid of the old vectors depending on the timestamp, which might potentially cause problems when trying to resolve conflicts. When put(), the coordinator generates the vector clock with the new version and writes the new version locally. Then replicates the new version to first N reachable node in the preference list. Consider write successful as long as there is W-1 nodes respond. Similarly, for get(), the coordinates request the data from first N reachable nodes from the preference list and as long as there are R-1 response it will then returns all version of the data. Once such hint is discovered, and A is recovered, D will send the replica to A and then delete the replica from itself. Hinted Handoff ensures read/writes won’t be rejected due to single node down or network failure.